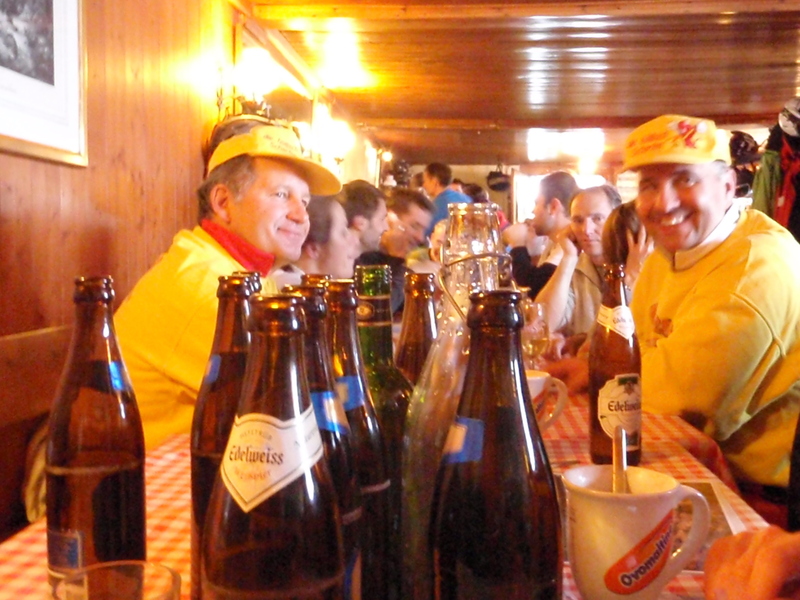 I’m back in Verbier – again, with people who know the place. This time I’m visiting Chaz, a friend who has picked up a last-minute space in a chalet for a week. Fresh snow is absent and there’s no prospect of any, but we’re enjoying superb skiing. The avalanche risk is low – two at altitude, one lower down – and the sun is shining. Chaz spent six weeks here last year and knows the place by heart. By chance we’ve teamed up with three great-value British guys, two skiers and a snowboarder, with whom we have tenuous links: they happen to be staying in my friend Camilla’s family apartment, and Chaz once crewed with one of them. Between them they seem to be seeking out the steepest slopes. 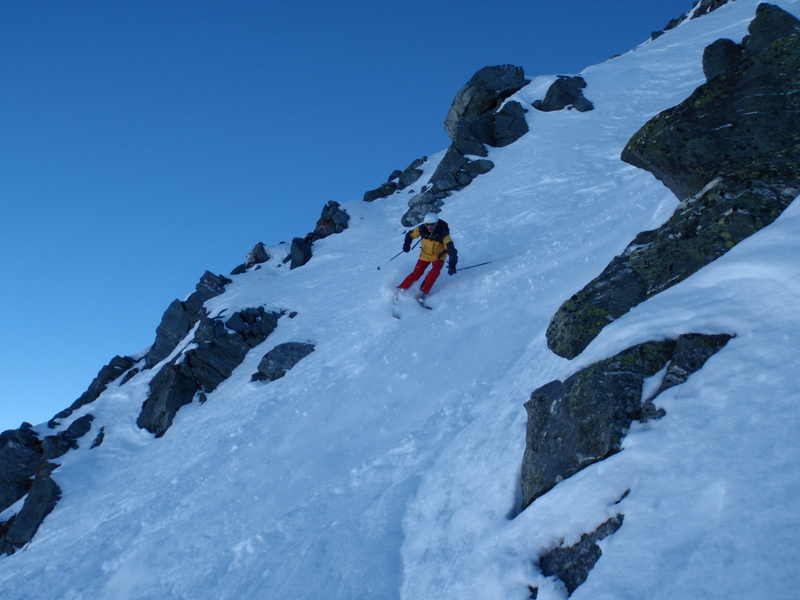 I feel tentative in some of the couloirs, but I ought to be grateful because all this gradient is good practice for my forthcoming trip to Fernie, Canada, which, according to guidebooks and hearsay, is vertiginous. It’s exhilarating exploring these slightly scary places, but with so many rocks about I wish I was wearing a helmet, like some of our group. I’m also marginally struggling on my GS skis (waist size 66cm) on the choppy bits, and after nearly catching an outside lower edge on a couple of 45-degree pitches I’ve rented some sensible Dynastars, which are a little wider. After three days of cloud, fog and snow, race day dawned clear and cold, fresh snow shimmering and the sun blinding and bright. Teresa and I headed up the Schilthorn at 9.15am for our 10.45-ish start – my number was 459, Teresa’s 495. We made a trip up the escalator to the loo, bagged up our jackets and extra layers and dropped them in a village-bound trolley, then skied to the start (the run down, sometimes tricky on long skis, was in the best condition it has been all week). Our early start numbers – thanks to reasonable past results – meant we set off among fast male racers. Go to the official site (see links, right) to have a look at the breakdown of nationalities, gender, age and so on. Racers set off every 12 seconds, so there are plenty of people on course at once, but this early the ruts are tame, and it’s easy to follow the smooth lines carved into the 7.5km route. Five big guys on long planks passed me by the end of the second schuss and then I had the run to myself, following my overtakers down Plattwang and into the hairpins (passing one racer who had fallen off an edge) before swinging left at the Hog’s Back. I tucked with all my might to get as high up the hill as possible, and minimise the skate-and-push up the wooded track, then it was downhill all the way into Muerren, via more hairpins and a final schuss and rutted corner into the finish. After watching the next 100 or so fly through the finish I handed my catsuit to a friend who was racing later and headed up to the Hog’s Back to watch more racers. 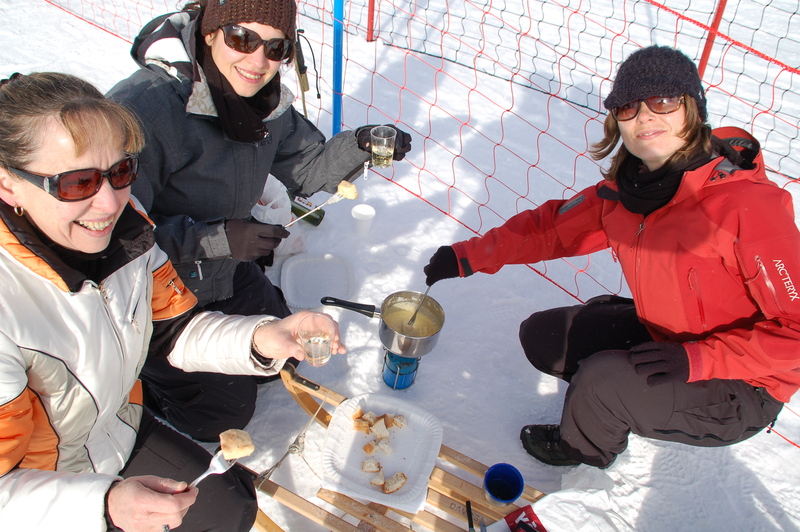 Among spectators was a happy group of local ladies enjoying a cheese fondue in the sunshine, complete with a bottle of Fendant. Down in the village there was a great party atmosphere, and later on we celebrated surviving the week at our favourite apres-ski spots, then at the Kandahar drinks party in the Jungfrau Hotel and at the wild and messy Bierfest in the sports hall. Below is a link to an article of mine that appeared in Country Life magazine in one of its January issues and at http://www.countrylife.co.uk. It was in the wake of two horrific recent avalanches in the Le Fornet section of Val d’Isere, in which two groups, led by mountain guides, were caught in separate incidents. During the Ski Club of GB leaders’ course (see posts from December) a lot of the teaching related to avalanches. I think that the more skiers and boarders know about the risks, and the better they understand them, the better. 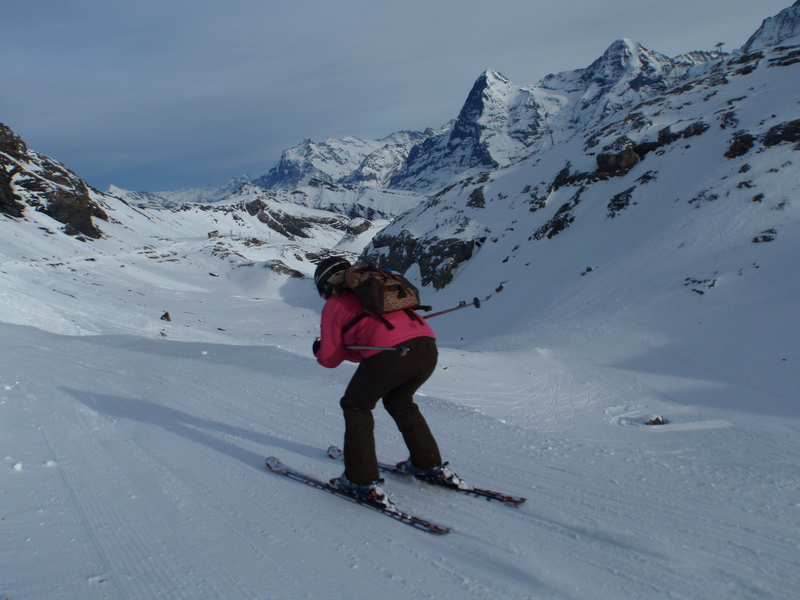 Sunday – arrive, collect start numbers and lift pass discount voucher from Kandahar office, drinks in Eiger Guesthouse, Jungfrau Bar and Gondelbar, supper at Staegerstuebli, crash out early-ish. Monday – gate training organised by Kandahar Ski Club; initial look at downhill course while visiblity good. Reserve race skis at Eddy Abegglen’s shop, plus cross-country skis and boots at a secret location: the gear is limited in the village, and we used to rent it in Lauterbrunnen, but we’ve found a source in Muerren. 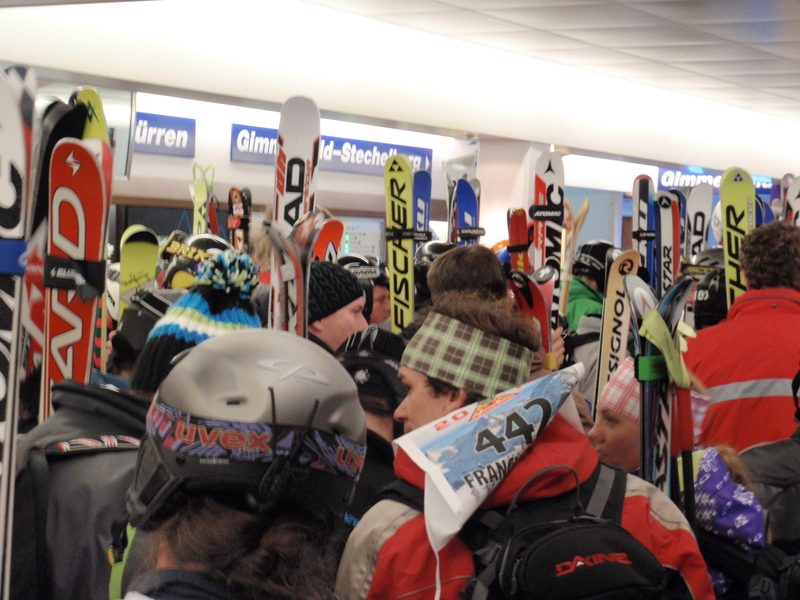 Leave regular skis to be sharpened. 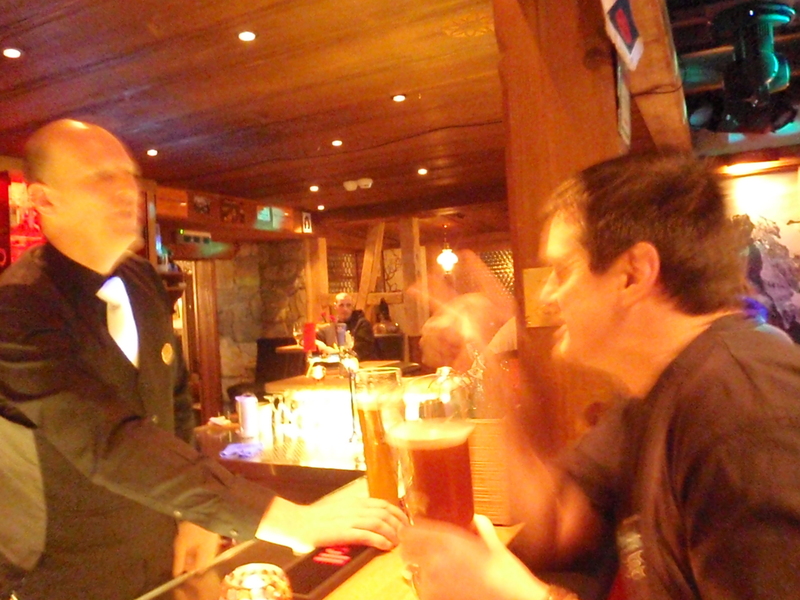 Ski Club of Great Britain drinks party at Eiger Hotel’s Taechi Bar. Meet old and new friends – and initially fail to recognise Sir Steve Redgrave, who’s racing this year for the first time. Supper at Eiger Guesthouse plus drinks at Staegerstuebli. 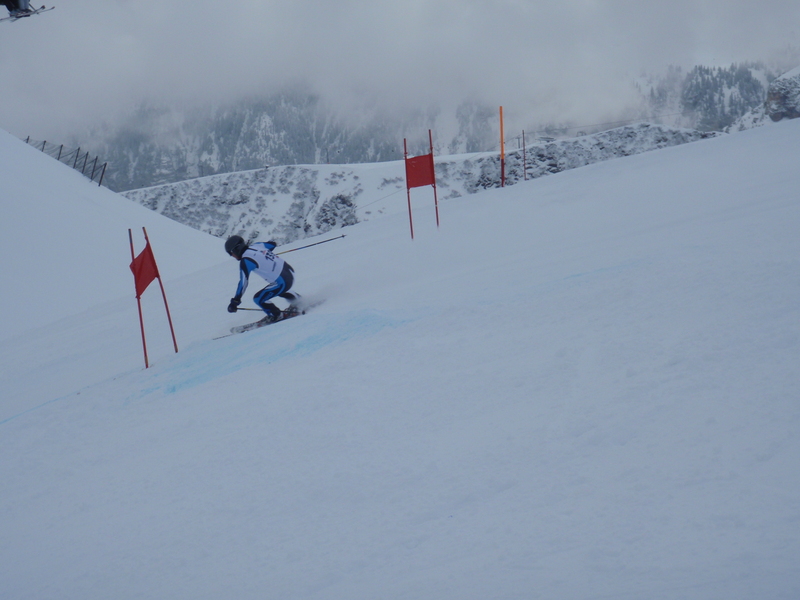 Tuesday – Kandahar giant slalom – two runs, plus a chilly session at the finish with the radio – then more downhill inspection. Collect cross-country skis for quick late-afternoon practice. Meat fondue at Blumental Hotel, a rustic, friendly place next-door to our lodgings. This isn’t for fondue snobs – it comes with an array of extras, such as tinned pineapple – but we love it, especially the cocktail and curry sauces. Midnight bed with few drinks – in readiness for cross-country tomorrow. 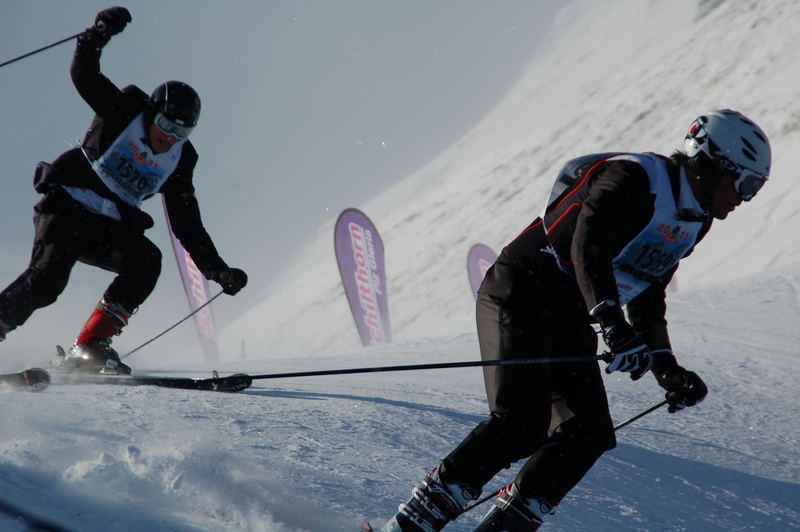 Wednesday – Two runs of Kandahar slalom followed by off-piste and a lie-down before the cross-country (see previous post). 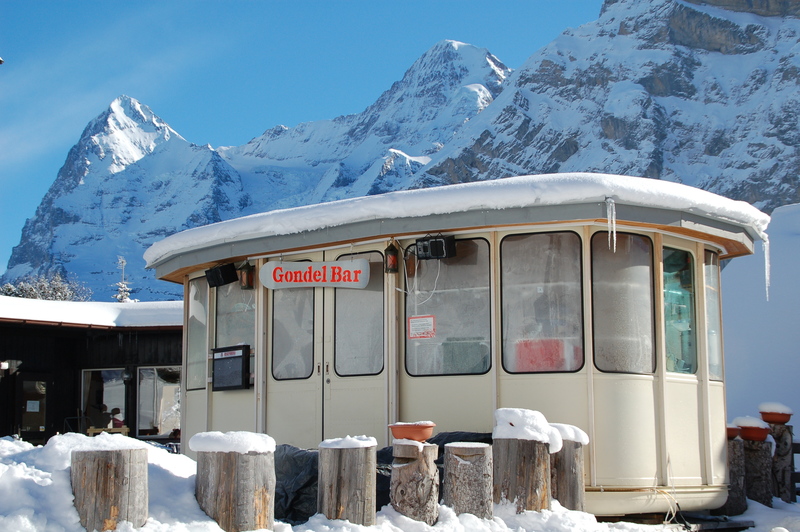 Drinks in the Gondelbar and Jungfrau, then supper with a fun group at the Hotel Bellevue’s cosy Jaegerstuebli. Not too late, as the GS looms. 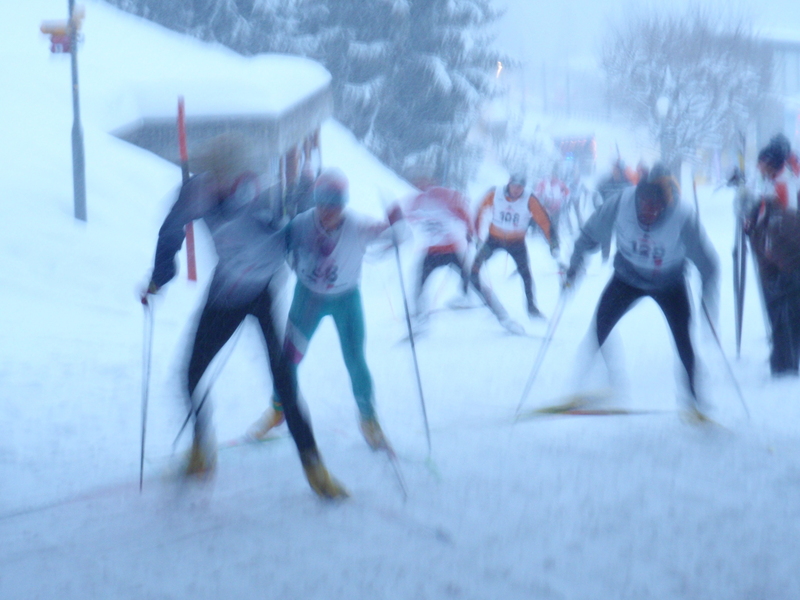 Thursday – Inferno giant slalom plus powder skiing. Drinks in the Gondelbar, where we meet a newly arrived group of British racers whose emphasis is more on party than pace. One confesses he threw up three times during last year’s downhill. 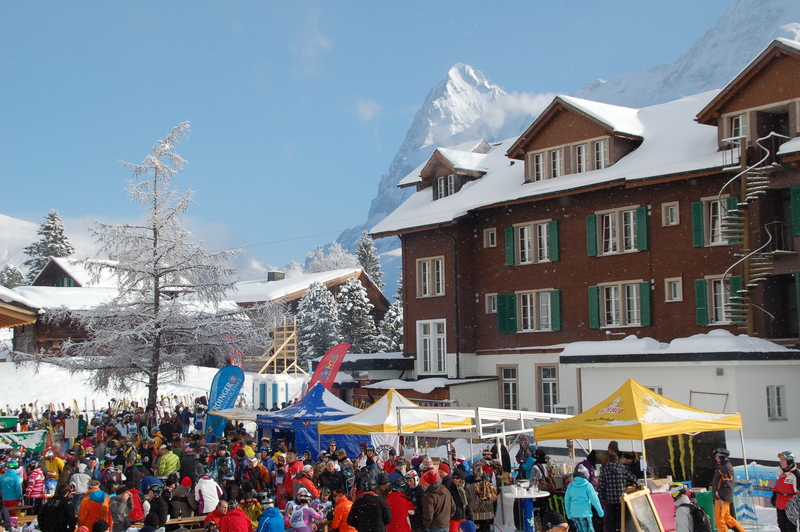 Kandahar drinks party at 6.30pm – our first visit of the night to the Bliemlichaeller (the Blumental’s disco), where Teresa and I land a surprising haul of prizes for club races and Inferno GS. Supper in the Staegerstuebli then back to Bliemli, Taechi and Bliemli in our latest night so far. Friday – Collect race skis and practise on them; make a final course inspection before changing to ‘normals’ for Schiltgrat powder. Quick hot chocolate with rum at Suppenalp, then Blumental supper and early night. Saturday – Race, watch the race and celebrate the race. Visit several aforementioned stuebli, attend Kandahar drinks and supper at Hotel Jungfrau then join the monster Bierfest in the sports hall till 2.30am. Proceed to Taechi then Bliemli and roll into bed a few hours later. A dozen or so Kandahar members – chiefly the faster men, plus one or two brave girls – have invested in a club catsuit. I was surprised to see that these fetching garments appeared not only for the Kandahar club slalom and giant slalom races (separate from the Inferno, and just for Brits, on Tuesday and Wednesday) but also for a training day on Monday. Well, I guess it’s cool to get into the spirit. The catsuit is blue, white and black, with diagonal lines and go-faster stripes in strategic places. “Those are quite nice,” I remarked to one regular K member yesterday as the suit was revealed in its glory when he removed his ski jacket. Without a second thought – and intending only to be matter-of-fact – he said: “Yes. You’d need a large.” Luckily I won’t have to invest, or to find out how large a suit I’d need: I have one already (black, with fluorescent padded elbows) – to be squeezed into for the downhill only, and removed as quickly as possible after crossing the finish line. This presents a problem when there’s enough snow for the downhill to go all the way to Lauterbrunnen, or if it goes to Winteregg, which is a train ride away from Chalet Fontana. Thankfully this year the finish line is expected to be in Muerren village, so after my 10.30am run I’ll be racing back to change into something less, well, stretchy. A word of warning if you, too, can’t resist the lure of looking like a real downhill racer: try to find a dark coloured one that doesn’t look as though it has been thrown up on, invest in a pair of zippable overtrousers for use immediately before and after the race, and hold your tummy in as you glide past the official photographer.